It's Baconalia at Denny's! Get it? The chain has launched an elaborate promotion, with a half a dozen bacon-themed additions to the menu, including a bacon sundae, bacon meat loaf and bacon flapjacks. We in the media are expected to marvel at its cleverness or cluck at the naughty, over-the-top excess. Really, though, we've all seen it before. Consumers, certainly, are unlikely to be impressed by either the menu or the wordy, unfunny manifesto that announced it. A few people extra will eat at Denny's out of curiosity, but most Denny's customers aren't there for the first time, or the last. This promotion, like so many in recent years, is a cheap attempt to milk a bacon fad that, in reality, ended years ago. But that's O.K. with me. The problem isn't that they relied too heavily on bacon. How could they not? Bacon is now to middle-of-the-road American restaurants what Kardashian covers are to magazines or explosions are to a Michael Bay movie. At one time it might have seemed vaguely outrageous, but now it's just a standby, a last resort when they can't think of anything else. Bacon may have ceased being something cool to talk about, but it stayed something wonderful to eat. And Denny's could easily be tapping into the true greatness of bacon, which is among America's greatest and oldest gifts to the world. Instead, Denny's is just coming up with zany recipes using cheap, waterlogged bacon, bacon that doesn't even have a name, bacon that I am willing to bet was cured using injection and puncture brining, and that is cut as thin as a cat's ear. Which is a shame since, in many ways, we are living in a golden age of bacon. We have more and better bacon, available by mail to everyone, than at any time previous, and new ones are emerging all the time. To say you're doing a bacon promotion and use just generic food-service slices is like having a baby-naming ceremony and then asking for suggestions from the crowd. Bacon deserves better! I've said it before, but apparently not strongly enough. There is a huge range of flavors and textures in bacon. Denny's and its like ought to get hip to them. There are the three axes of bacon flavor: salt vs. sweet, meat vs. fat and smoke vs. cure. There is bacon from bellies and bacon from jowls. There is commodity pork bacon, which can be great, and bacon from heritage animals like wooly Mangalitsas or Berkshires, which can be indescribably great. Bacon is a whole world unto itself, the first food of the American frontier and the most irreplaceable of all familiar flavors for Americans in exile. These bacons and many more like them take time to make. They have to lie around in a room covered with salt and sugar, dehydrating down and concentrating their flavor. They need to be exposed to smoldering hardwood fumes, preferably from hickory coals. They need to be made from good pigs that have lived long enough, and well enough, to have developed some modicum of flavor. And they need to be tasted on their own. Denny's tried in at least one of the Baconalia dishes to do the right thing. It offers a straight-up bacon sampler platter, but it's just three nameless bacons, one of which, unspeakably, is made of turkey. Is that bad faith or what? Maybe American restaurants should have to get a bacon license before they are allowed to whore out such an important commodity this way. Or maybe not. 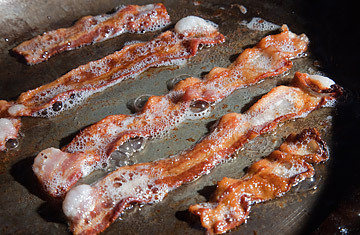 I'd rather have bad bacon  thin, limp, bland, even deep-fried  than no bacon at all. I am an American, after all. Ozersky is a James Beard Awardwinning food writer and the author of The Hamburger: A History. You can listen to his weekly show at the Heritage Radio Network and read his column on home cooking on Rachael Ray's website. He is currently at work on a biography of Colonel Sanders. See the 10 worst fast-food meals.